The Mandolin Cafe's definitive mandolin Christmas list, below. More images than we're allowed to upload so we'll list them instead. Many of these are rotating on the Cafe home page at various times during late November and Decmeber. Lara & Reyes - "Navidad"
Simon Mayor "Winter with Mandolins" available at Elderly and iTunes. This is a great recording...non standard carols. Just discovered it and got it this year. "Tinsel Tunes" is a Sugar Hill compilation on iTunes that is great. Chris Thile playing "Bring a Torch", killer twin mando version of "Sleigh Ride" with Sam Bush, Nashville Bluegrass band, Pychograss, etc. Newgrange's Christmas album is nice with Mike Marshall and Tim O'Brien on mando and mando family instruments. Evan Marshall's solo mando Christmas album is great. The Mair-Davis Duo "The Sounding Joy" (at Elderly) is a fine classical approach to mandolin/guitar Christmas and related carols...including many that you don't hear. One of my favorites. Also, if you can find it...Laurie Lewis and Tom Rozum "Winter's Grace" is a great CD with a lot of mando playing on it. Not sure if it is available anywhere, which is a shame if not. Oh yeah...and Alison Brown's "Evergreen" album features a lot of mando from Joe Craven. It is also a great recording in general. OMG... be still my heart. How did I miss that one? Must head to YouTube to see if I can find cuts. Thank you. 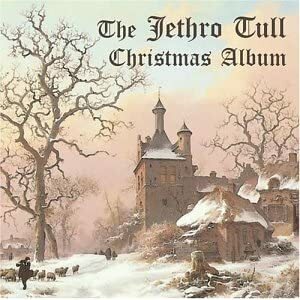 Special two CD edition of this holiday release from the veteran Rockers featuring the original Jethro Tull Christmas Album (2003) plus the more recent recording Jethro Tull - Live At St Brides. 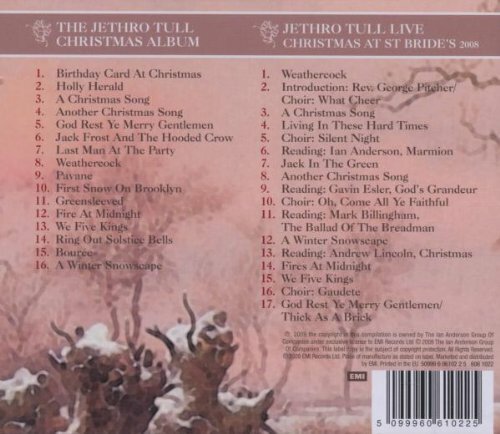 Last Christmas (2008), Jethro Tull performed and recorded a live concert at St Bride's Church in London. The profits from all tickets sold for the service, went to The Connection at St Martins, a charitable facility for the care of London's homeless community. Ian Anderson's view is that "we all have a duty of care and responsibility to help the less fortunate." No mando, but the Flecktones' Christmas album is a real hoot. This would be for a non mandolin content list, but Bruce Cockburn's "Christmas" contains excellent material. And let your fingers find The Music in the Wood." That's what supplanted Grisman's "Acoustic Christmas" as my favorite Christmas recording years ago. It's hard to find though, the last I knew. Well you can check out my Christmas Album - there is mandolin on It Came Upon a Midnight Clear, Come Thou Long Expected Jesus, The First Noel, and Sweet Little Jesus Boy is just voice and mandolin. This is a very nice recording. Folks should definitely check it out. I am very fond of St Agnes Fountain for holiday music. Chris Leslie of Fairport Convention provides the mandolin playing. "Snowbound" by Jim's Red Pants, Hillary and Rick Wagner, extraordinary multi-instrumentalist duo in Dayton, OH, http://www.rickandhillarywagner.com/Welcome.html. I recommend #16. Christmas Morn at http://jimsredpants.bandcamp.com/album/jims-red-pants, a compilation from their six CDs (can't find Snowbound on-line). Hillary and Rick also are devoted teachers of adults and school children on classical violin, mandolin, guitar and banjo; can't count how many kids they have launched into a life of music. Don't dismiss this as completely "no mando." Andy Statman is on several cuts. Terrific and typically eclectic. Sorry, calling piracy on that download. Plus, providing a link to a .zip file on the web is begging for trouble. Last edited by Scott Tichenor; Dec-06-2012 at 11:06am. Reason: illegal download -- violates forum posting guidelines. A Very Special Acoustic Christmas - Various artists including Sam Bush, Ricky Skaggs, Dan Tyminski, Rhonda Vincent (mandolin perspective). Theres a great version of "Let It Snow, Let It Snow, Let It Snow" by Sammy! Cool. Sorry, I saw the live show, complete with Casey Driessen on fiddle and a band of Tuvan throat singers, but no mando ... and must have leaped to a conclusion about the recording. Of course I'm not interested in recordings if they're not exactly like the live show, and I refuse to listen to Andy Statman playing Christmas music unless he sticks to the melody ... whoops, wrong thread. All times are GMT -5. The time now is 7:47am.